How I've longed to write something beautiful and deep in this, my back-to-church community blast. But part of returning to church after time away is that there is sooooooooo much to do! We return to the Sanctuary for Eucharistic celebration. Come see the face of Christ shining back at you. We share good, cheap food and community just around the corner from church. It's a Crossing institution, and if it's your first time, we subsidize with $5 (you'd be amazed what you can get for that much). 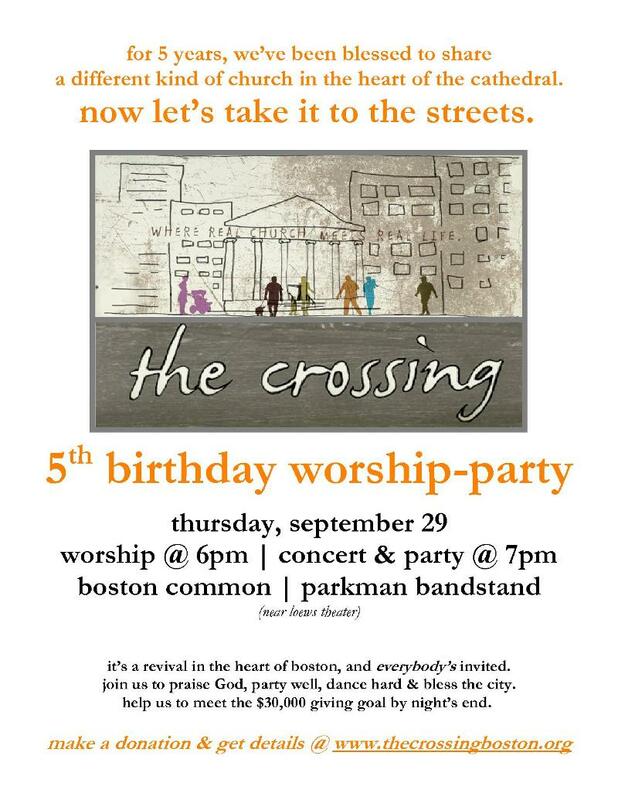 Show some Christian love to the entire city, as we celebrate 5 years of ministry with worship party on Boston Common. Bring friends, bring strangers, bring some potluck and get ready to worship and share food and blessing with our city. Download the invite here. Pass it around! 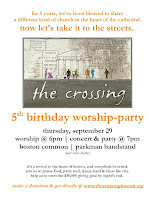 CONTACT Vicki at Vicki@thecrossingboston.org or Valerie at Valerie@thecrossingboston.org for info and to help out. 'Cuz this party will take a whole village! READ A WHOLE LOT MORE IN THIS WEEK'S "LIFE @ THE CROSSING" BLAST.